Alexander Marmer has a Bachelor's degree in Computer Science from Pace University in New York City. He is an officer for the NYPD. A Sergeant in the US Army National Guard, he was deployed in support of Operation Iraqi Freedom 2006 and Operation Enduring Freedom 2012. Alexander is a freelance writer for the US Army Fort Drum newspaper, The Mountaineer. He is based in Montgomery, New York. In a fantastic new book by debut author Alexander Marmer, Four Ways to Pharaoh Khufu is a tale that readers will find exciting, adventurous and an absolute page turner! Follow the story of Michael Doyle and a group of explorers intent on uncovering the secrets of the Great Pyramid of Giza, secrets that have been held for more than 4500 years. A terrible tragedy occurs that seems to connect to the Great Pyramid, and the explorers are chased by the descendants of a group of elite warriors, determined to keep the secrets of the pyramid just that - secret. Will one of the biggest secrets in all of human history finally be revealed? You'll have to read the book to find out. I so enjoyed Four Ways to Pharaoh Khufu. Author Alexander Marmer has done an absolutely fantastic job in creating a story that is a real roller coaster and will have his readers obsessively turning the pages from the very first words. He has created characters that his readers will enjoy and connect with, and his ability to describe surroundings will make one think that they have simply slipped through the pages and into Egypt alongside the characters. If those traits aren't the hallmark of a great author, I'm not sure what is. 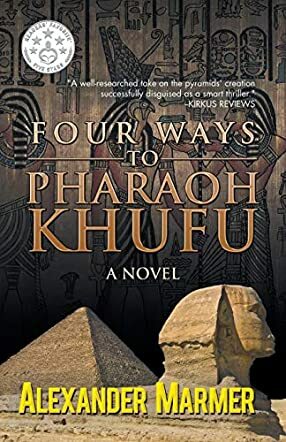 Any reader who enjoys a mystery, an adventurous and thrilling story, or just a great work of fiction in general would love Four Ways to Pharaoh Khufu. I highly recommend this book, and look forward to reading more from the very talented and highly promising new author, Alexander Marmer, in the near future!